The Joyce is on to something with its Ballet Festival, in which six companies share the theater for two weeks in the previously sleepy ballet month of August. It's a bit like many of the other summer festivals with dance, like the Fringe, DanceNow, River2River, in that variety is key, but it's all grounded in the lexicon of ballet. Another distinguishing feature is the inclusion of many outstanding dancers who are moonlighting from ABT, NYCB, or other large troupes. I caught two companies in the first week. Josh Beamish's move: thecompany began its program with the choreographer performing solo in the first part of Pierced, to music by David Lang. Beamish is more muscular than most male ballet dancers, particularly his legs, and this gives his movement the sense of being slightly arduous and rooted, notably when he suspends on relevé and drops his weight solidly. There's tension within his body that emanates drama. The second part of the piece featured ABT's Luciana Paris and Sterling Baca, who, with a sleek fluidity and eagerness, embodied Beamish's style best among the men. Of the women, Stephanie Williams, an Aussie who distinguished herself in ABT's recent Met season, was especially luminous; she danced Stay with Dimitri Kleioris (a magnetic fellow Australian who will appear in Flesh and Bone on Starz network). Williams is the kind of dancer who may not knock you out at first, but eventually you notice her ability to adapt to any style, as well as her remarkable strength as seen in a devilish backbend with the front leg extended, steadied by him. Their duet had tender moments—embraces, a swift leap onto his shoulder, she supporting his full weight while leaning against her. The program served as a kind of primer of Beamish's movement, beginning with a solo packed with contained energy, building through a duet in which a dialogue seemed to be taking place along with an urgency and strong directional pulls, followed by the more romantic Stay. It culminated in the premiere of Surface Properties, an ambitious dance for 10 with busy, witty video by Matt Keegan, and Janie Taylor's sleek black and mint costumes. The groupings and duets moved with an adrenalized, urban feel; exit and entrance walks were done with a louche, street-wise attitude. Roman Zhurbin is ABT's reigning character dancer, so good at acting that it's easy to forget he's a terrific dancer; he partnered with Isadora Loyola in a charming duet section in front of a pong-like video, which distracted slightly. Zhong-Jing Fang led a "femme" section with verve, and Baca looked in the zone during the finale. Ashley Bouder is one of the fleetest, most athletic dancers at NYCB, but she can be cast in roles that skew cute. In her own vehicle, the Ashley Bouder Project, performing with fellow NYCB dancers, she immediately defied that image, with gratifying results. Adriana Pierce's Unsaid is a duet for Bouder and Preston Chamblee; they sport chic, sheer overcoats designed by Reid and Harriet. The coats, along with lit squares (Jimmy Lawlor) and spatial arrangements connote interior and exterior, intimacy and emotional distance, to music by Grieg played live. 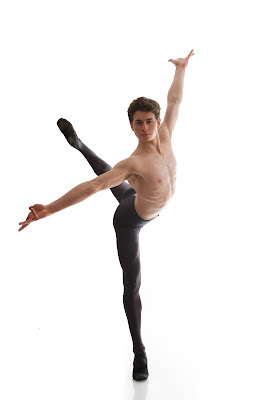 Pierce, a dancer with Miami City Ballet, makes expressive phrases, building upon a pirouette, to preparation, to a double pirouette, increasing in intensity. Best of all, there was no cute in sight. In Passing is a filmed ballet, something we've seen in Pontus Lidberg's work, and in ambitious projects such as NY Export: Opus Jazz. While we don't have the pleasures and risks of live performance, Andrea Schermoly's direction takes us to varied locations—a theater house, a tunnel, a chic bedroom, a studio being painted. Jumpy cuts and fast-motion alter time, sometimes to comical effect. The setting moves from dreamy to impatient, tracking the moves of Bouder, Amar Ramasar, Indiana Woodward, and Antonio Carmena. It's a different, intriguing way of experiencing ballet and one person's aesthetic, and the quality of the recording, and the way it entirely filled the screen, was appreciated. But the most memorable moments are of Bouder on relevé, being held or spun by Ramasar, in various poses and levels of tension and repose. It was a quenching dose of ballet by some of the art's top dancers, and alongside the two other works, notably by young women, showed a conceptual curiosity that also refreshed.